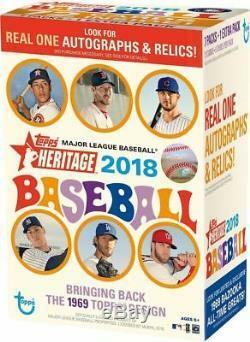 2018 TOPPS HERITAGE BASEBALL 16 BOX FACTORY SEALED RETAIL BLASTER CASE OHTANI. 16 BOX FACTORY SEALED RETAIL BLASTER CASE. Configuration: 16 boxes per case. Current stars, MLB legends and rookies are showcased on these classic cards. Highlights of this set include Real One Autographs, Clubhouse Collection Relics, Flashback Autograph Relics! 500 total players including Veterans and Rookies in the 1969 Topps Design. Collect all 100 High-Numbered Short-Printed cards. Look for the following base subsets: League Leaders, World Series Highlights, Topps News All-Stars, Rookie Stars. 500 total subjects featuring a foil stamp of the 100th Anniversary MLB Silhouetted Batter logo worn in 1969. 500 total subjects featuring rare magenta color variation backs. 100 subjects from the Base set showcased on Chrome technology. Chrome Refractor Parallel - #'d to 569. Chrome Black Bordered Parallel - #'d to 69. Chrome SuperFractor Parallel - #'d 1/1. Chrome HOT BOX Refractor Parallel RETAIL VALUE BOX. Mini Base Variation - #'d to 100. Retired and active players sign ON-CARD autographs in blue ink. Select cards will feature players that appeared on a Topps card in 1969. Real One Special Edition - Hand #'d to 69 or less. Reggie Jackson Buyback Rookie Autographs. Vintage 1969 Topps Reggie Jackson Rookie Cards will feature an ON-CARD autograph from Mr. Retired players from the 1969 Seattle Pilots signing ON-CARD autographs in blue ink. Uniform and bat relic cards to be signed ON-CARD by active and retired players. Hand-numbered to 25 or less. Retired subjects will sign ON-CARD autographs. The card will feature a highlight from their 1969 season. Autograph Patch Parallel - Hand-numbered 1/1. If we accept your BEST OFFER you must pay within 24 hours. If you need more time, please let us know in advance. We only get the price that was paid for the item. Please understand this when making an offer or purchasing from us. If there is a problem with your order we will make it right. PLEASE NOTE: WE ARE NOT RESPONSIBLE FOR REDEMPTIONS CARDS THAT HAVE EXPIRED. All sales are final on trading card packs boxes and cases. We are not responsible for factory odds. We guarantee all of our products to be factory sealed. We strive to provide a 5-Star service and are proud to provide this level of service to you. We promise to do the same. Your item to you sooner! BASE CARDS 500 total players including Veterans and Rookies in the 1969 Topps Design. BASE CARD PARALLELS 100th Anniversary 500 total subjects featuring a foil stamp of the 100th Anniversary MLB Silhouetted Batter logo worn in 1969. Magenta Backs 500 total subjects featuring rare magenta color variation backs. BASE CARD VARIATIONS Base Card Chrome Parallels Base Card Chrome Variation 100 subjects from the Base set showcased on Chrome technology. Chrome Refractor Parallel - #'d to 569. Chrome Black Bordered Parallel - #'d to 69. Chrome SuperFractor Parallel - #'d 1/1. Chrome HOT BOX Refractor Parallel RETAIL VALUE BOX Base Card Mini Variations Mini Base Variation - #'d to 100. AUTOGRAPH CARDS Real One Autographs Retired and active players sign ON-CARD autographs in blue ink. Real One Special Edition - Hand #'d to 69 or less. Reggie Jackson Buyback Rookie Autographs Vintage 1969 Topps Reggie Jackson Rookie Cards will feature an ON-CARD autograph from Mr. Seattle Pilots Autographs Retired players from the 1969 Seattle Pilots signing ON-CARD autographs in blue ink. AUTOGRAPH RELIC CARDS Clubhouse Collection Autograph Relics Uniform and bat relic cards to be signed ON-CARD by active and retired players. Flashbacks Autograph Relics Retired subjects will sign ON-CARD autographs. Autograph Patch Parallel - Hand-numbered 1/1. HOBBY ONLY RELIC CARDS and more! The item "2018 TOPPS HERITAGE BASEBALL 16 BOX FACTORY SEALED RETAIL BLASTER CASE OHTANI" is in sale since Sunday, October 7, 2018. This item is in the category "Sports Mem, Cards & Fan Shop\Sports Trading Cards\Baseball Cards". The seller is "collectibleman" and is located in Glenview, Illinois. This item can be shipped to United States, Canada, United Kingdom, Denmark, Romania, Slovakia, Bulgaria, Czech republic, Finland, Hungary, Latvia, Lithuania, Malta, Estonia, Australia, Greece, Portugal, Cyprus, Slovenia, Japan, China, Sweden, South Korea, Indonesia, Taiwan, South africa, Thailand, Belgium, France, Hong Kong, Ireland, Netherlands, Poland, Spain, Italy, Germany, Austria, Bahamas, Israel, Mexico, New Zealand, Philippines, Singapore, Switzerland, Norway, Saudi arabia, United arab emirates, Qatar, Kuwait, Bahrain, Croatia, Malaysia, Brazil, Chile, Colombia, Costa rica, Panama, Trinidad and tobago, Guatemala, Honduras, Jamaica, Antigua and barbuda, Aruba, Belize, Dominica, Grenada, Saint kitts and nevis, Saint lucia, Montserrat, Turks and caicos islands, Barbados, Bangladesh, Bermuda, Brunei darussalam, Bolivia, Ecuador, Egypt, French guiana, Guernsey, Gibraltar, Guadeloupe, Iceland, Jersey, Jordan, Cambodia, Cayman islands, Liechtenstein, Sri lanka, Luxembourg, Monaco, Macao, Martinique, Maldives, Nicaragua, Oman, Peru, Pakistan, Paraguay, Reunion, Viet nam.